Hundreds of trout, eels and other smaller fish are being rescued from a drying out river bed. 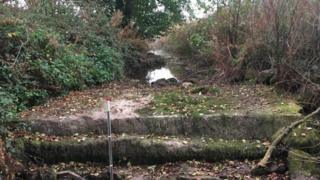 Environment Agency staff have been removing the fish from a stretch of the River Dore in Herefordshire as a section of it has already dried up. They've been taken two miles (3.2km) downstream of the dried-up stretch in Peterchurch. Spokesman Dave Throup said rainfall had been passing over that part of the county, leaving the river dry. He also said it would take two to three days of rain to get the stretch back up to a healthy level. "This is purely about the level of local rainfall. Herefordshire has been very dry for the last six to eight weeks," he said. "It is unusual as upstream the river is flowing fine." Even more unusually, the dried-up stretch of the stream is associated with flash floods, he added. A few years ago, a school minibus had to be pulled out of the water after the river flooded. At least 400 trout plus eels and lamprey and smaller fish such as stickleback have been moved from the area so far. Rain is expected over the weekend, Mr Throup said, but did not know if it would be enough to get the river flowing properly again.